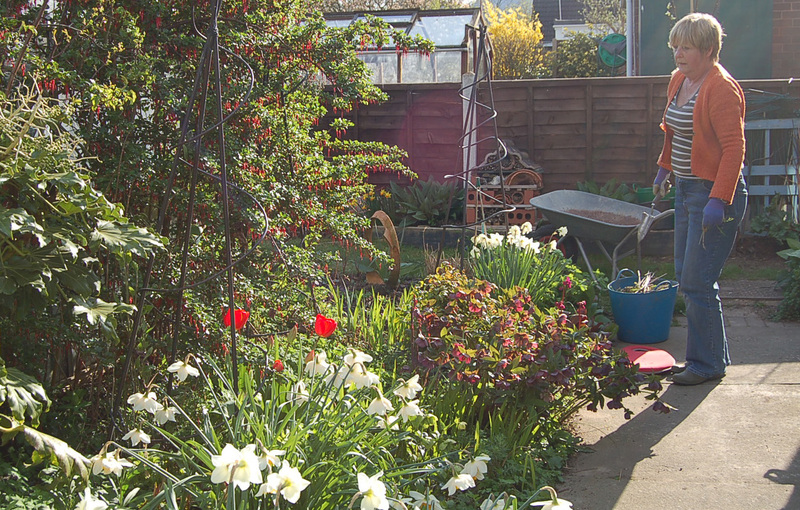 A Wander around our Garden in April. 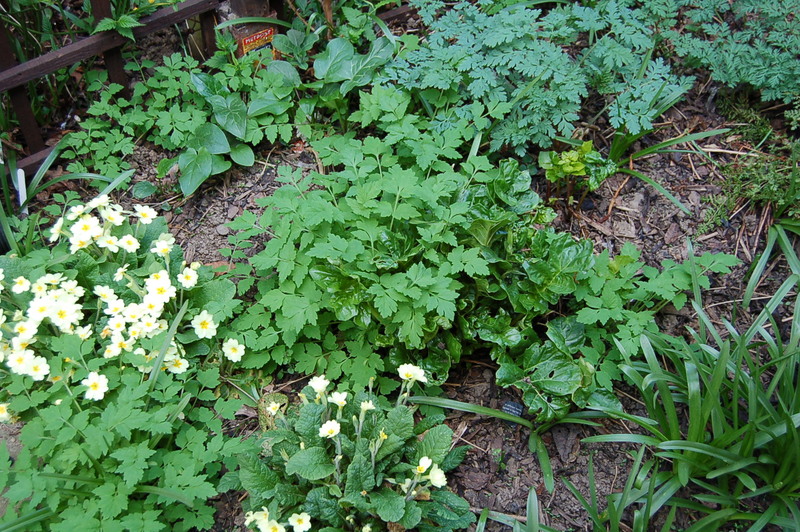 It is already into the fourth month of the year and so this is the fourth in this monthly series of garden wandering posts. 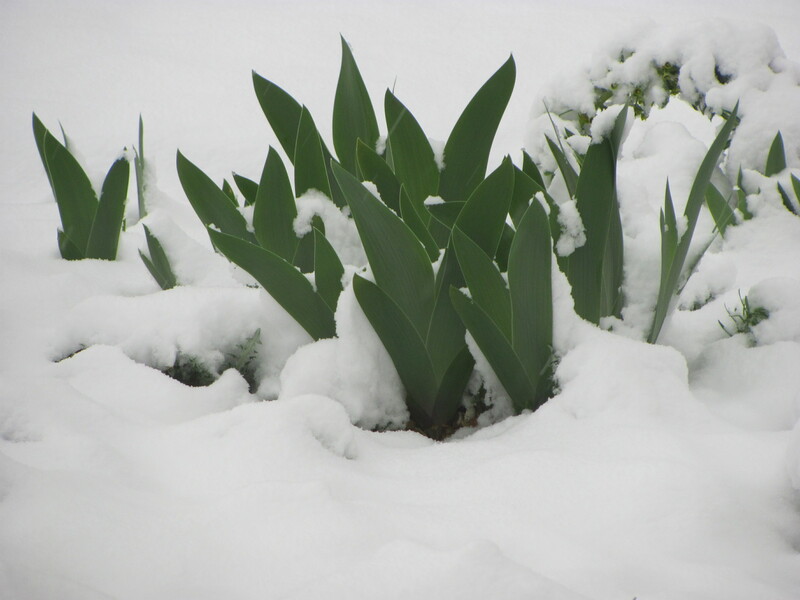 So much happens in April, so many plants start into growth, so many seeds are sown and the weather changes so often. Frost, hail, sun, mild, cold, windy, calm – everything comes randomly and we gardeners get caught out inappropriately clothed. Wildlife is equally confused, with bees, hoverflies, butterflies and wasps appearing on warmer days and disappearing as soon as it cools down again. Taking advantage of some bonus sunshine. Some spring bulbs are going over while others are in full swing, some tree blossoms are going over while others are just coming into flower. There is so much to do in the garden, productive or ornamental, and it feels good to be out there doing it. 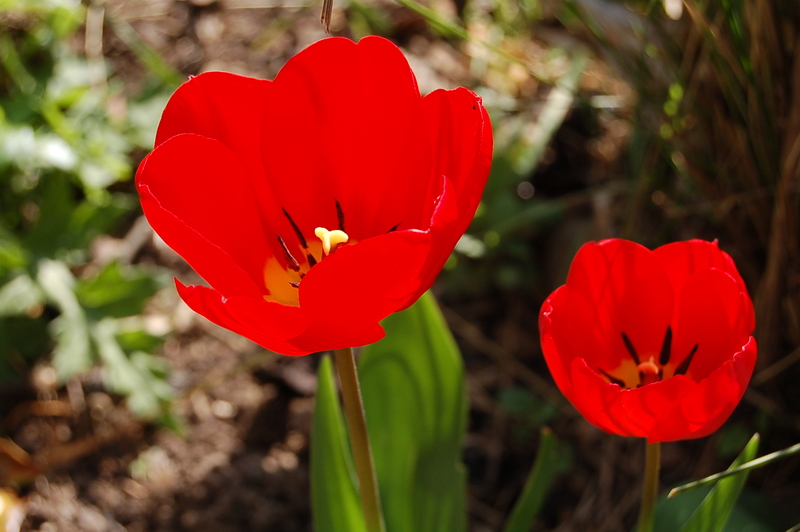 How red can a flower be! 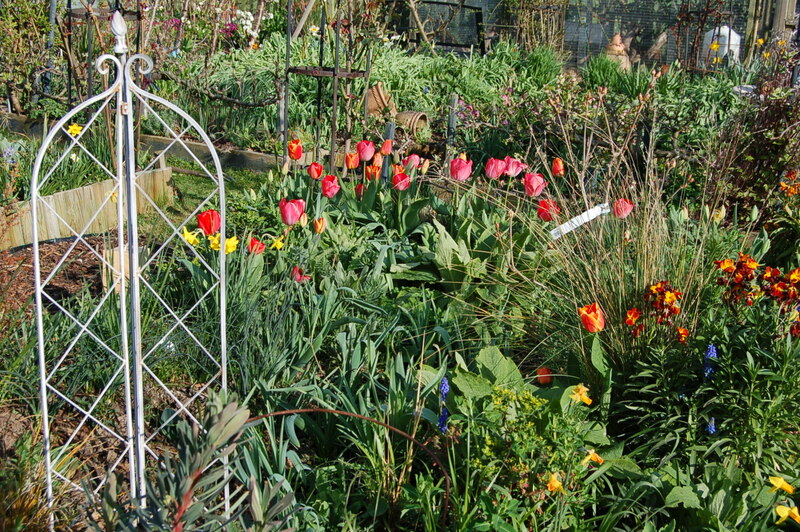 As soon as April arrives we know the garden will look and feel differently every day. Come around our garden with me and my camera and see what is going on. 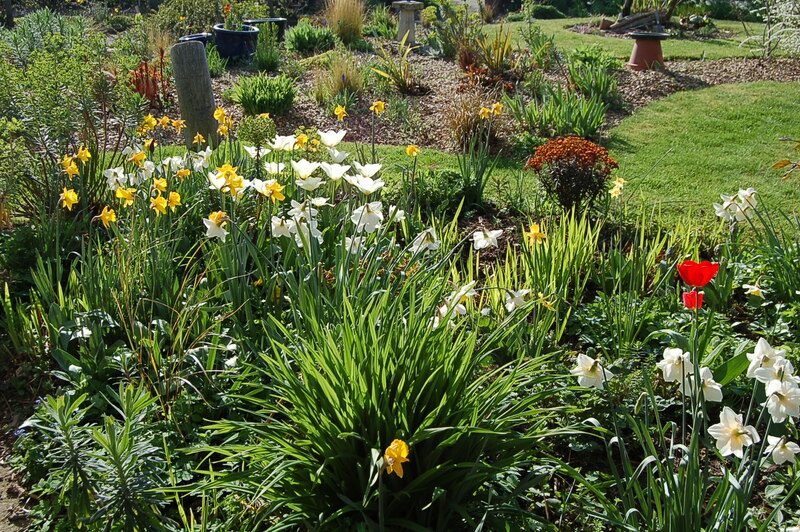 The front garden glows in the afternoon sunshine, with every shade of green in new herbaceous growth splattered with the many colours of bulbs. 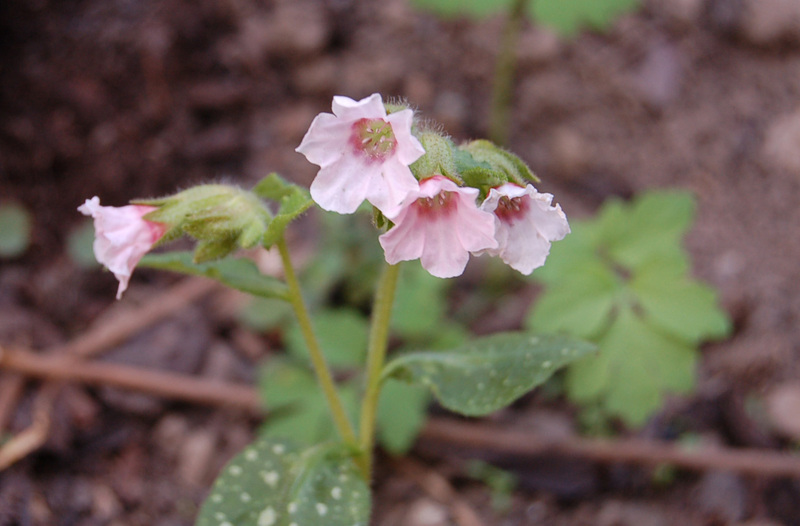 The Shade Garden is soon to reach its peak time, with its fresh leafy growth and the tiny, pale jewels of flowers. 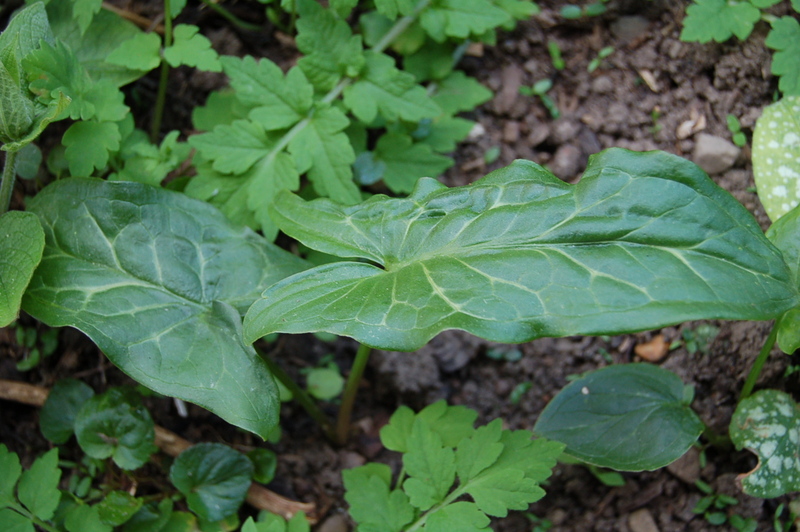 Pulmonarias, Dicentras, Anemones, Arums and Corydalis are all budding up and beginning to flower while the ferns are hardly showing any signs of awakening. The Shade Garden bursting into life. 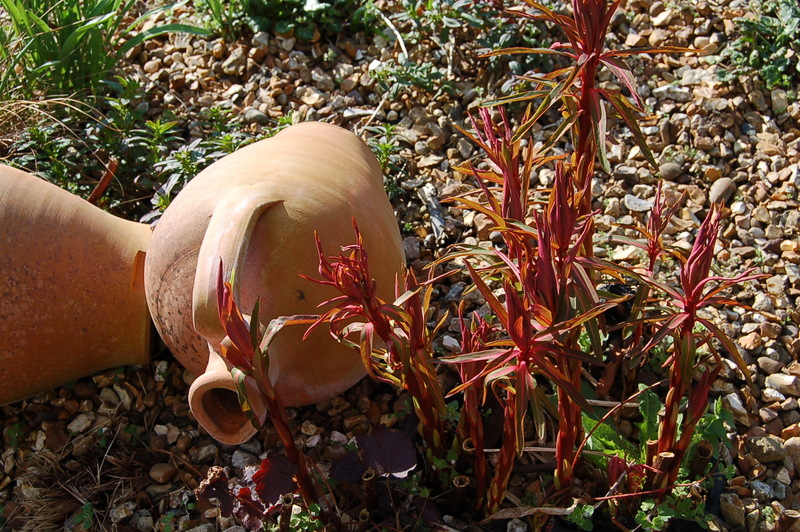 On the gravel patch, which we call our “Chatto Garden”, new foliage is bursting through. Irises, Euphorbias are starting into healthy growth. The large terra-cotta pot of bulbs is bubbling over with the blue of Muscari and a sprinkling of tiny mauve species Tulips. 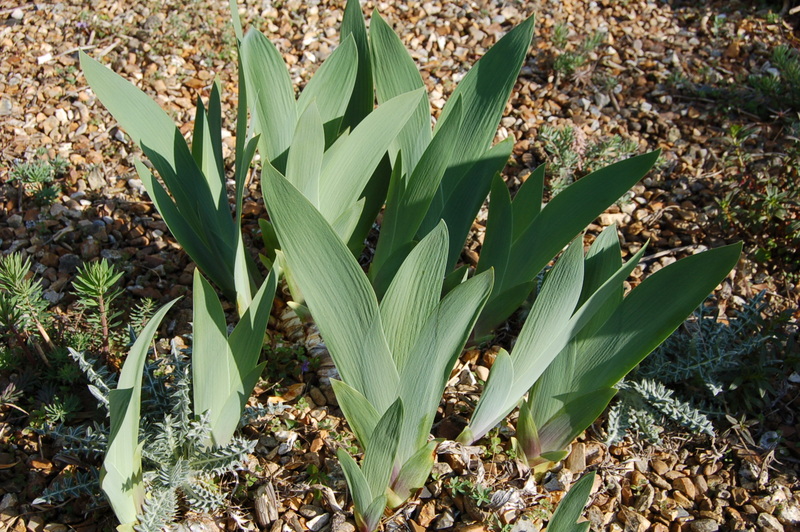 The glaucous sword shaped iris leaves. 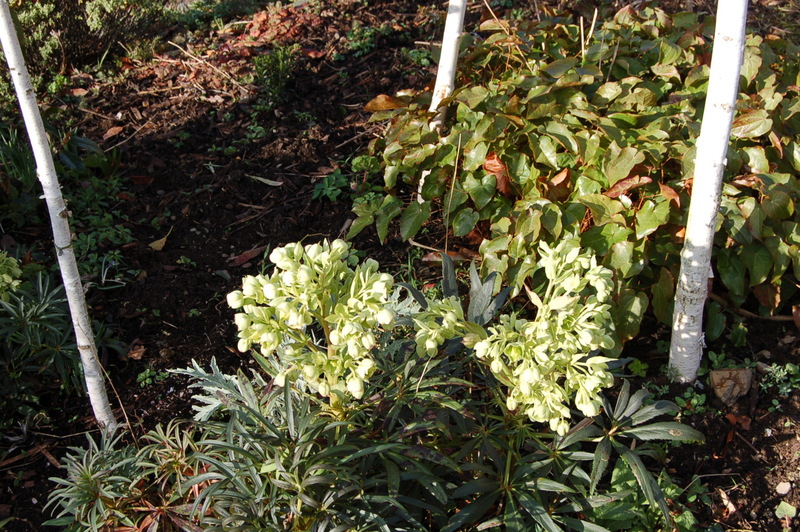 Spears of Euphorbia griffithii "Dixter" piercing the gravel. 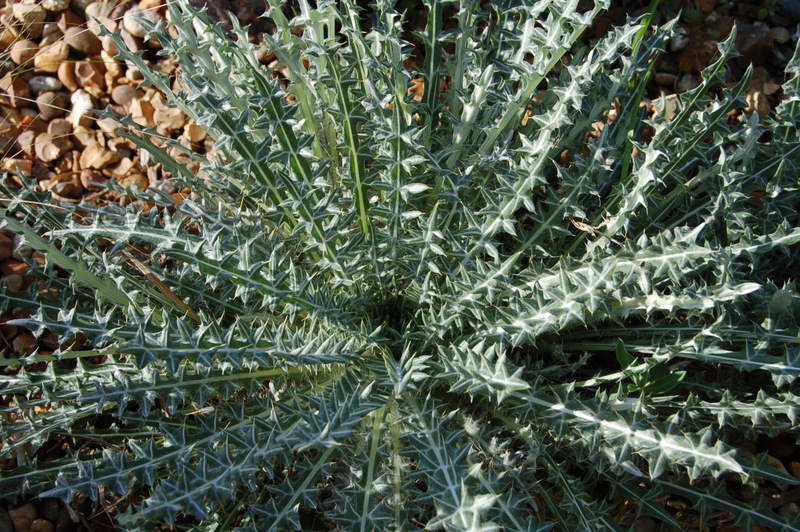 The thistle like spiked and variegated Galactites tomentosa. 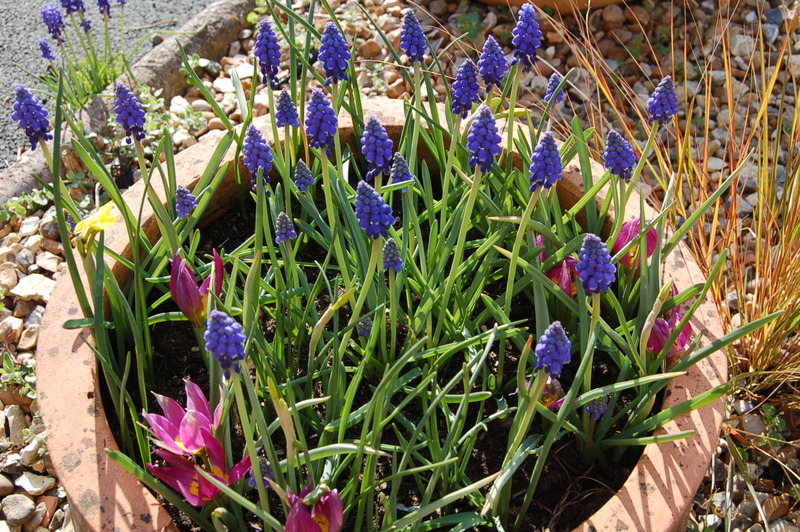 Muscari blue and tulip mauve give a gentle colourway to the big pot. 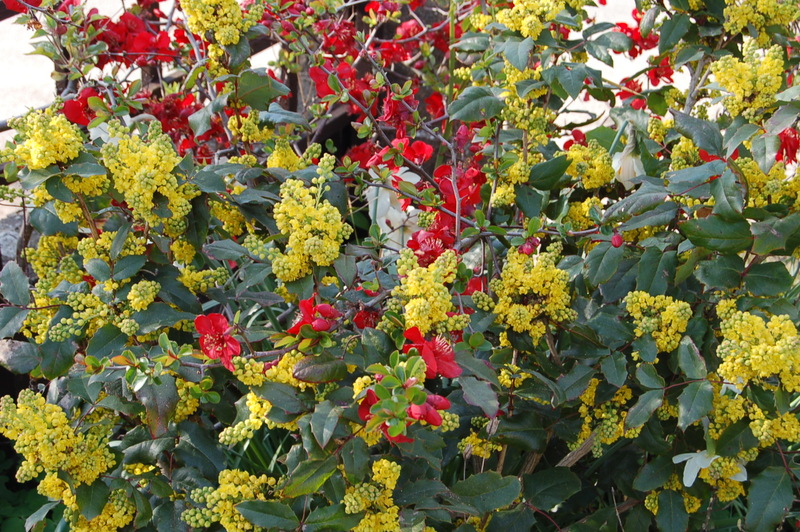 Bright welcome at the gate - yellow Mahonia and red Cydonia. 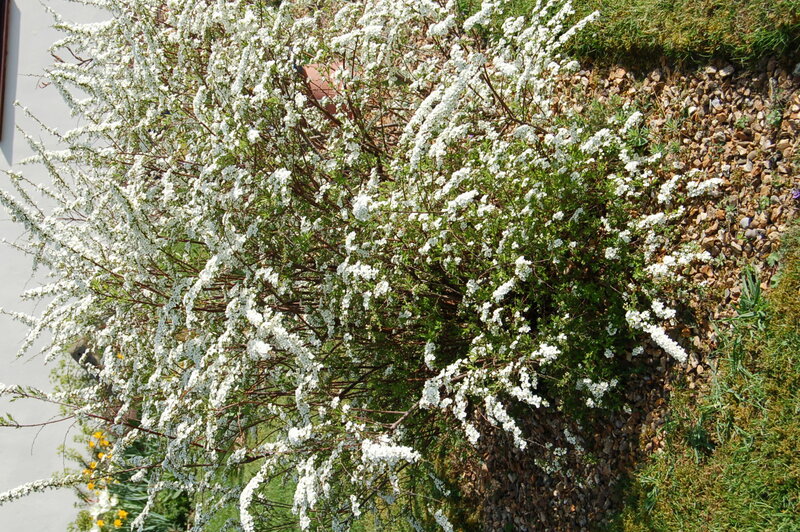 Trees and shrubs are a little later coming to life in the spring, the miniature Chestnut’ sticky buds are only just bursting while the Amelanchier lamarckii and Spiraea “The Bride” are in their full white ball gowns. "The Bride" is always such a good arching shape. 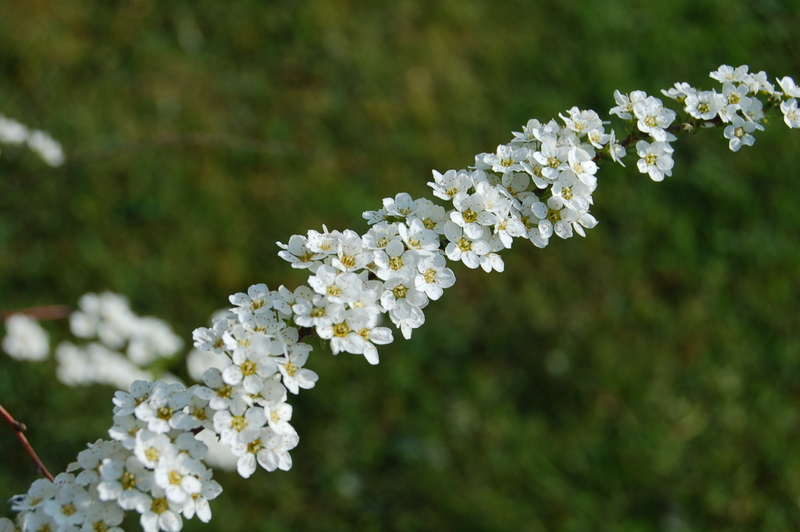 The long arching raceme of Spiraea. 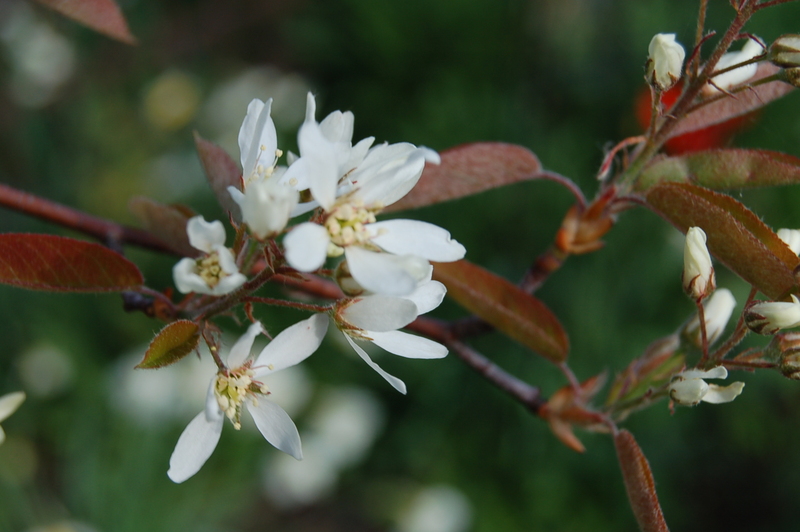 Amelanchier blossom like delicate stars. 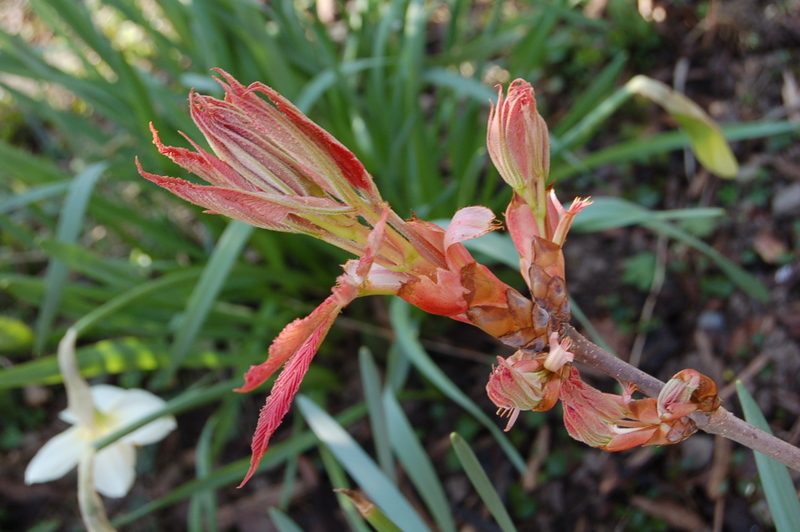 Chestnut buds burst out in salmons, russets and reds. In the side garden by our main entrance the two potted apple trees are in full flower, with blossoms of many shades of pink, promising lots of juicy fruit to enjoy. 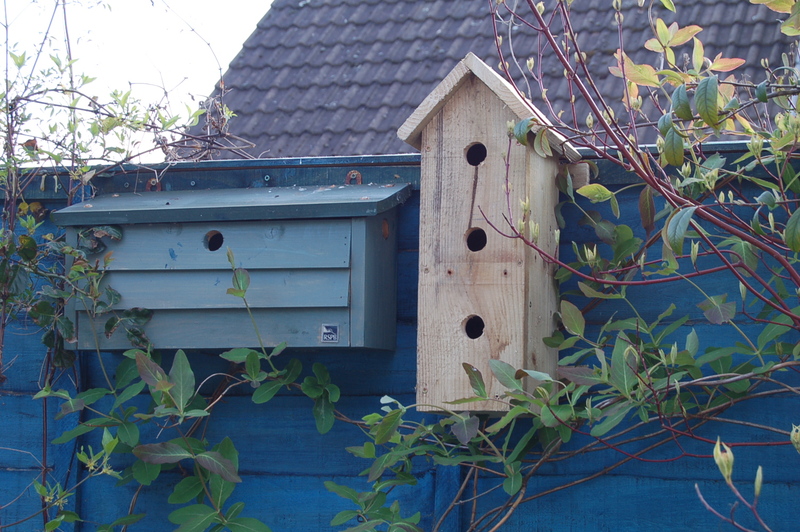 We have added a second House Sparrow nesting box giving six nest holes altogether and hopefully a little less noisy bickering. The new box is apartment living as opposed to the terraced original. 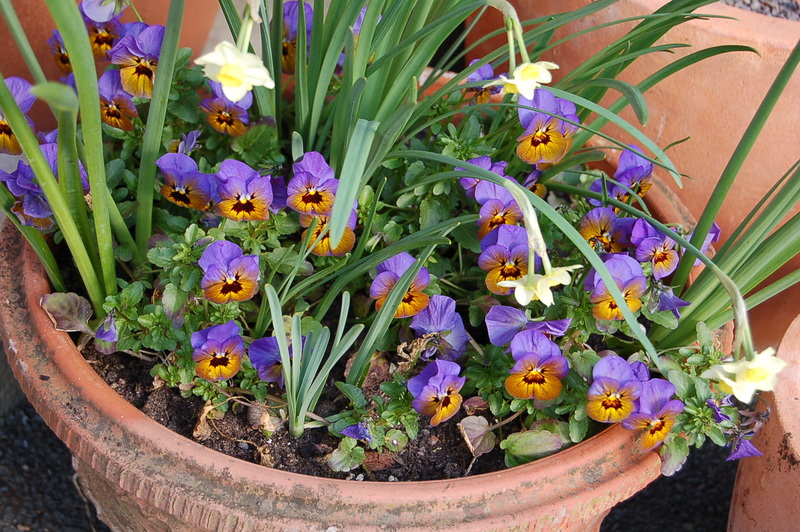 Right by our doorstep is a pot of violas in an unusual colour combination of blue and brown. 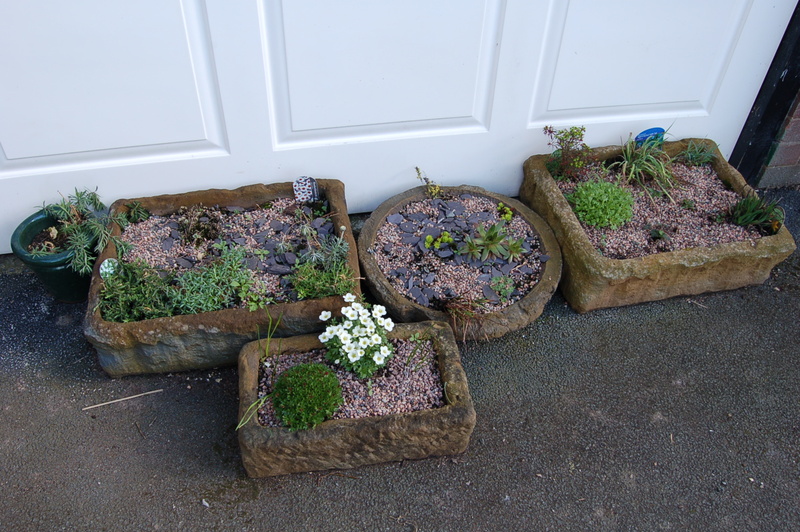 In front of the garage door our replanted alpine troughs are beginning to come to life. 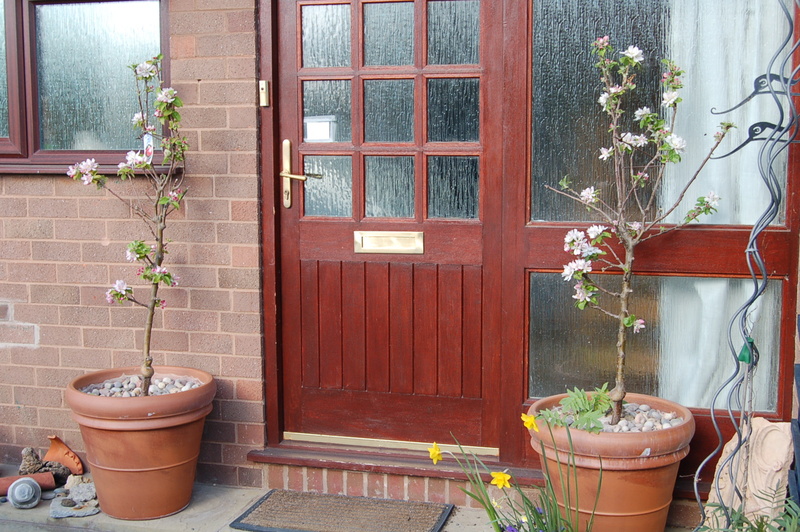 Our miniature apple trees welcome callers. 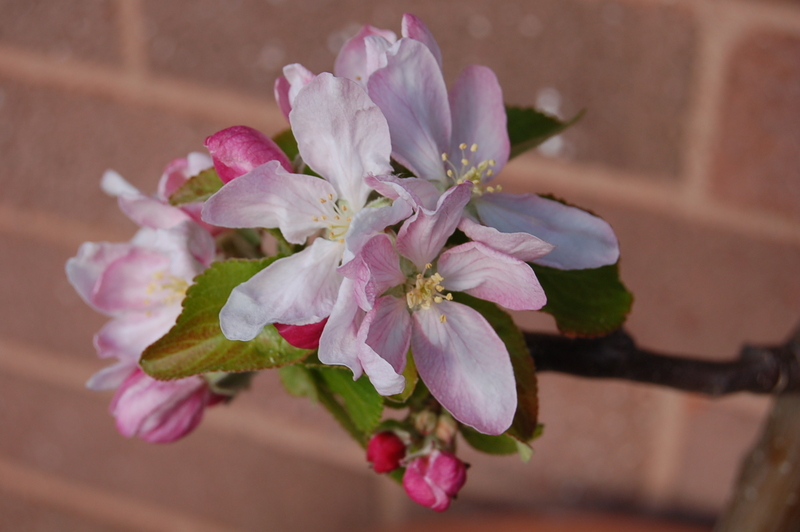 Apple blossoms - pink beauties. 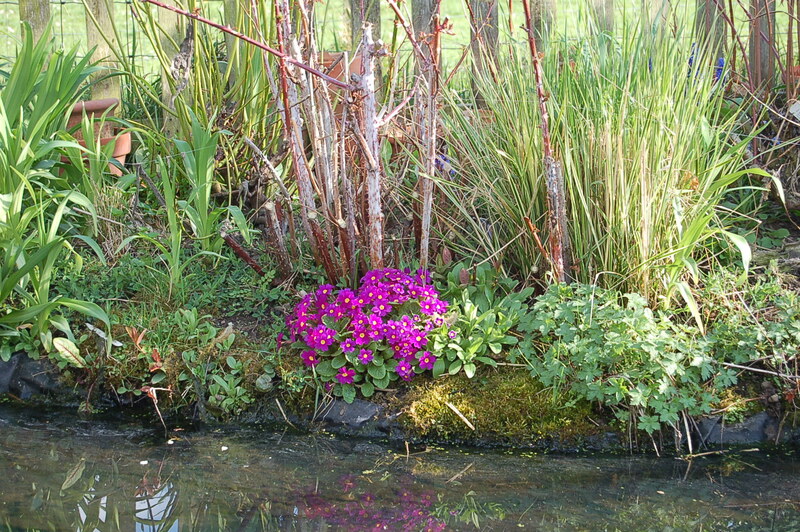 Alpine troughs protected from the cold winds. Wandering into the back garden it is hard to know where to point the lens first as so much is happening. The fruit trees are in blossom, tulips add their jewel colours in every border and new leaves are appearing on most shrubs and perennials. 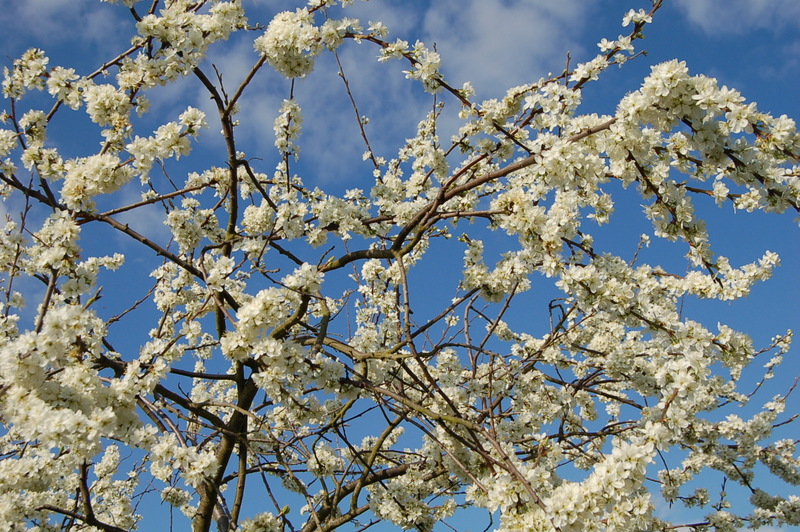 A mass of Damson blossom against a blue sky. Jude, "The Undergardener" at work in the "Shed Bed". The garden is full of sound, scents and movement. In the pools Pond Skaters perform their dances on the surface and tadpoles wriggle in black masses in the shallow pebble bay. 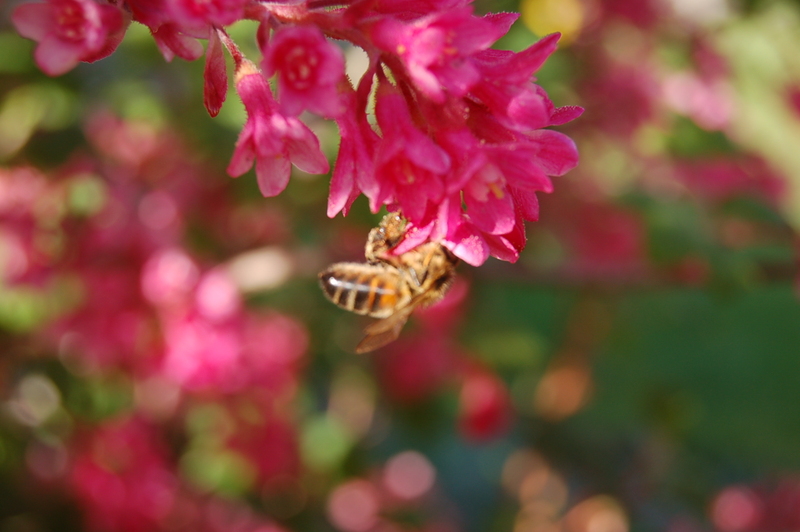 Around each flowering shrub bees and hoverflies flit and buzz. In nearby fields Skylarks sing their “high in the sky” songs and the haunting call of Curlews reach us from the damp land alongside the nearby fishery. But the strangest sound of all is the regular sound of Tawny Owls calling to each other – have they lost their biological clocks? The calling starts mid-afternoon on most days. Lush growth at the pool side. 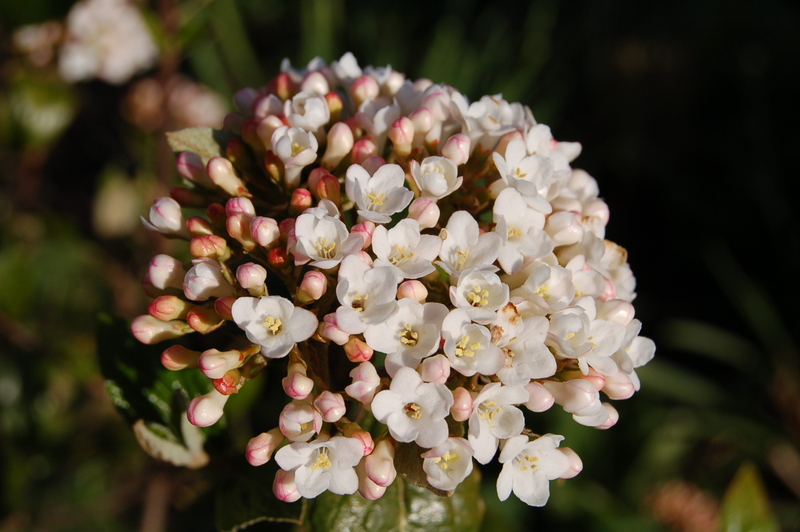 Scent is provided by Viburnum, Mahonias, Wallflowers, Flowering Currants, Hyancinths, Daffodils and the last of the flowers on the Daphnes. Herby scents come with the new fresh greens of the mints, thymes, marjorams and fennel. 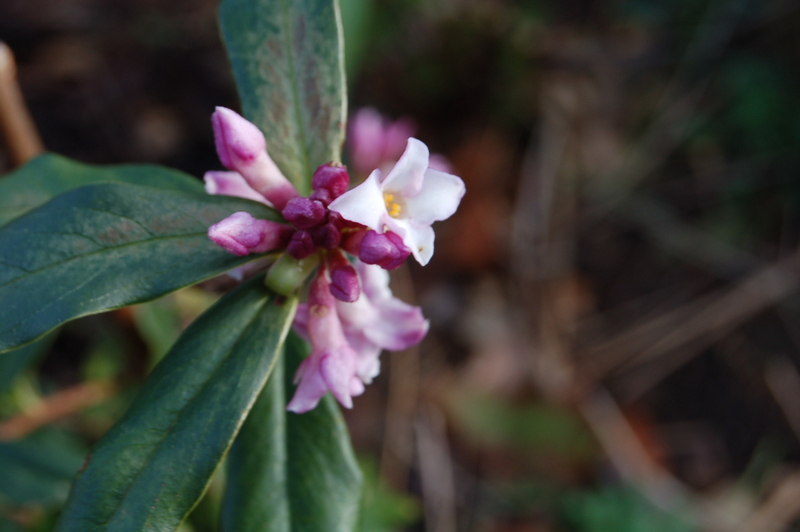 Strong in scent beautiful in colour, the last flowers on the Daphne. The complex flower head of a viburnum. 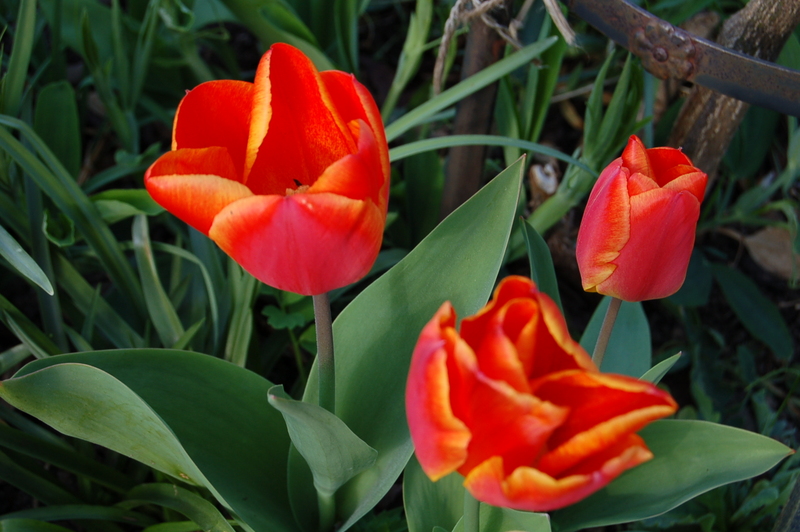 In the Secret Garden it is the tulips that take centre stage, in so many colours and shapes. The Secret Garden awakens in Spring. 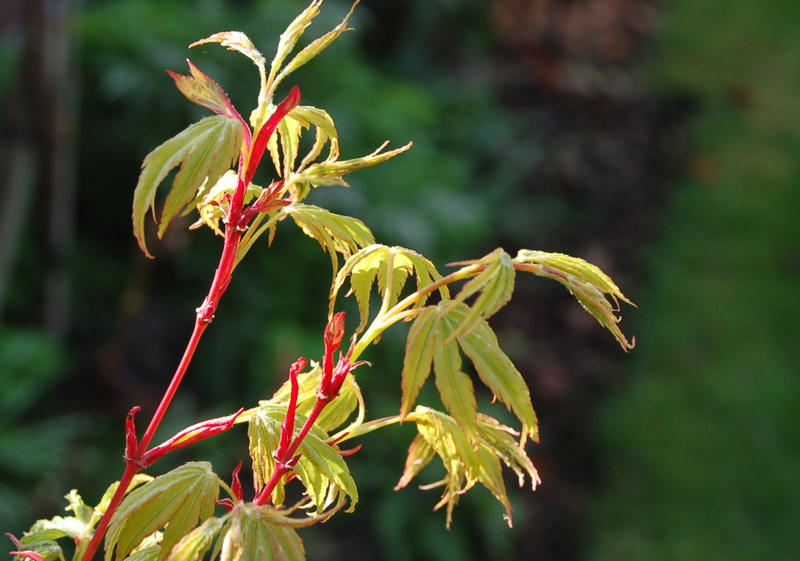 Some of the most impressive new foliage is to be found on our acers, growing under the trees we grow as a wind break, acid green, lemon yellow, flaming orange and salmon. 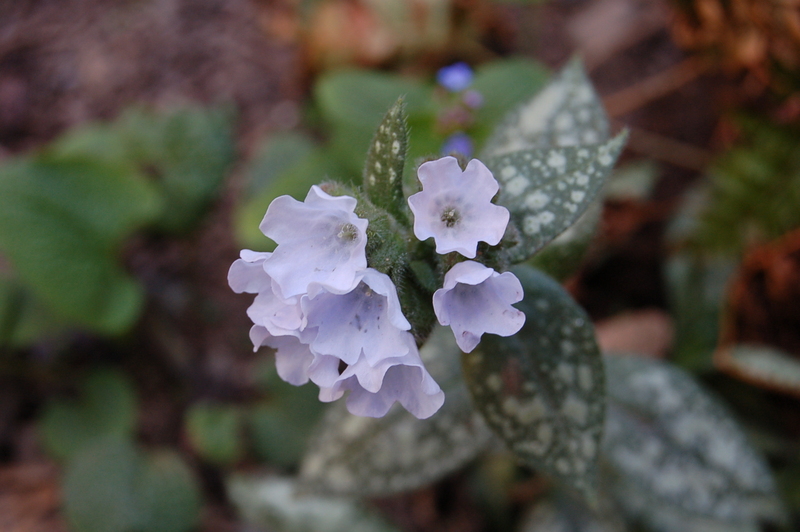 New brightly coloured foliage shines in mottled shade. 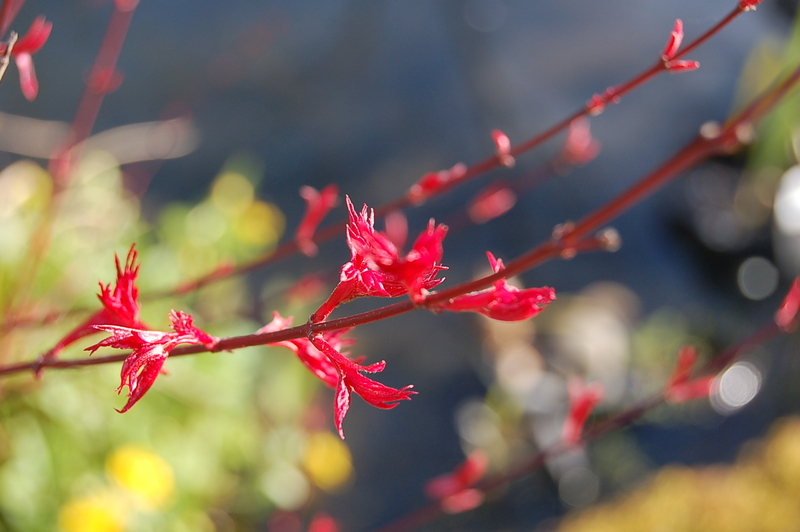 Glowing red fresh, new leaves. We have eventually relented and cut down the last of our many grasses. We leave them as late as possible and often leave some too late and end up cutting new growth coming up within the old. 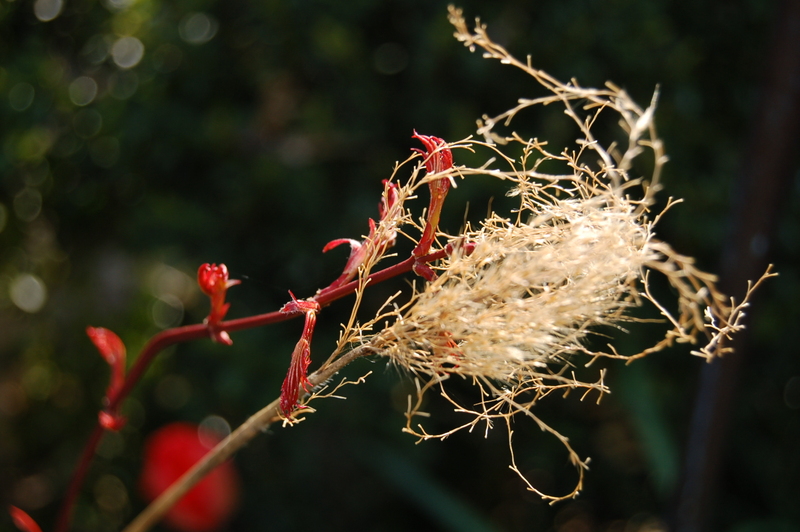 This Miscanthus napalensis was left until last, understandably. Old grass and new acer. 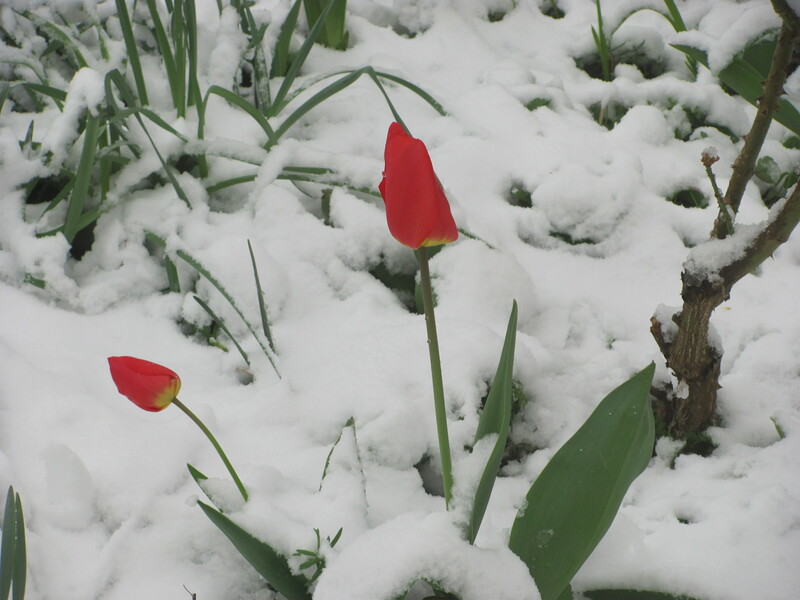 Just to show how fickle the month of April can be, the day after I took the photos for this blog we woke to three inches of snow and large flakes continued to fall all morning. 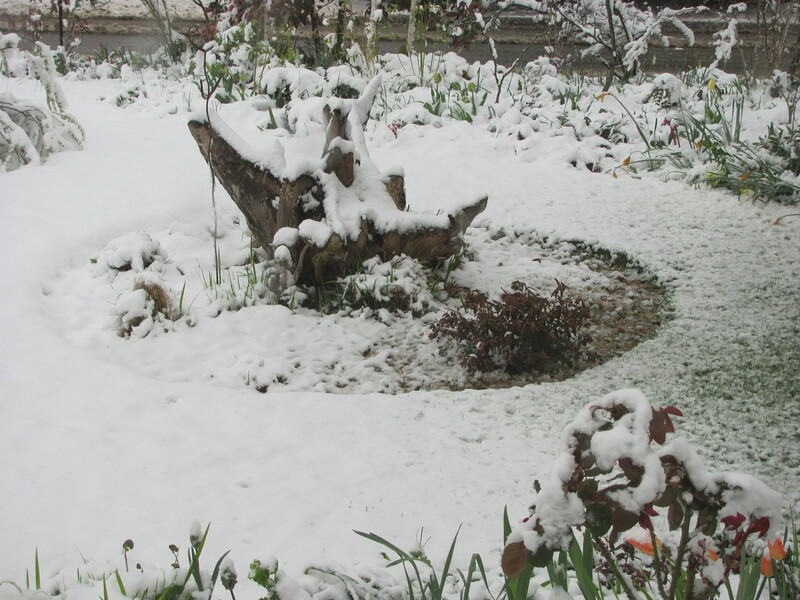 Many tulips and daffodils were flattened and our clump of Black Bamboo was pinned to the ground by the sheer weight of snow. Iris swords piercing the snow. I shall finish with two shots – one before the snow and one after. 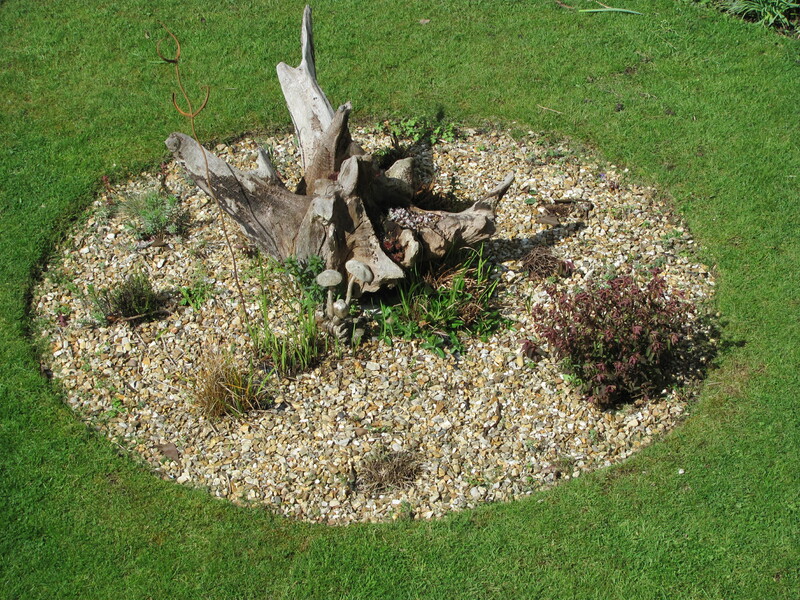 This lovely old oak tree root is our miniature stumpery – all we have room for! This entry was posted in birds, garden design, garden photography, garden wildlife, gardening, hardy perennials, ornamental grasses, ornamental trees and shrubs, photography, shrubs, trees and tagged apples, April, birds, chestnuts, foliage, foliage plants, fruit and veg, fruit and vegetable growing, fruit., garden photography, garden wildlife, gardening, grasses, greenhouse gardening, grown your own, ornamental trees, scented plants, tulips, viburnum. Bookmark the permalink. 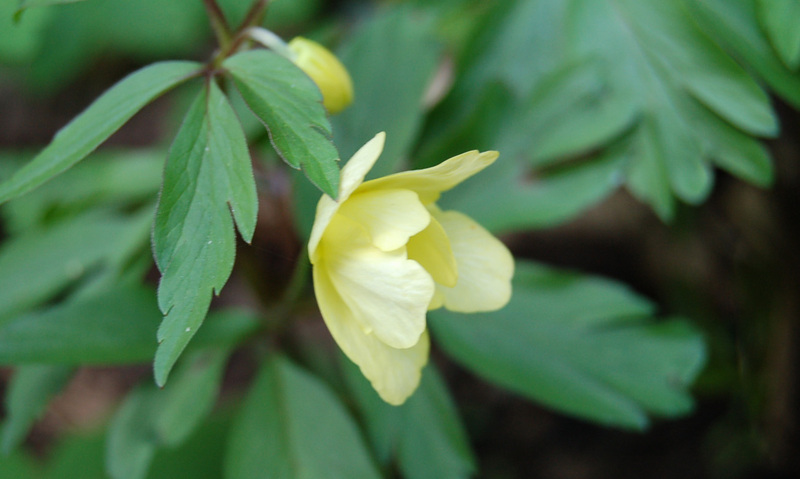 6 Responses to A Wander around our Garden in April. Great comment! I need more red!! Thanks Elaine. This is our best Spring ever since we started this garden years ago. We love it to work in and to drink coffee in!